Surrounded by nature and beaches there’s no way NOT to discover yourself here! Costa Rica has a special place in my heart because it’s where my journey began. It’s one of my favorite places because it’s impossible NOT to surround yourself with either nature, or the beach. The longer you are with one, the other, or both, you naturally begin to hear your own rhythm and distinguish it from everyone else’s that you’ve taken on as your own. There are two airports – Liberia and San Jose. Liberia is closer to the Guanacaste area and northern beaches, and San Juan is closer to the Carribbean side – so think about where you plan to go as a way to choose the best airport for you. If you are traveling on from Costa Rica to other destinations in Latin America or South America, you’ll probably fly out of San Jose. Excellent. Honestly, it would be hard not to discover yourself in Costa Rica! Because everywhere you go you will either be surrounded by abundant nature or beaches, your soul will naturally relax, unwind, and find it’s natural rhythm. You don’t even need to meditate or do yoga (but you can!) The pull of smoothies is irresistible – imagine smoothies made from your favorite fruit, and water. That’s it! No milk, no protein powder, just natural goodness. You will be forced to eat food that’s healthy and you will love it. And, most of the people you’ll meet aren’t just happy, they are delighted with life! You won’t find expensive cosmetics or clothing, or anyone using them either. This is a place where you get to show up as you are instead of covering yourself up to try and look better than you perceive you do. It inspires self-acceptance and happy connections. Very good. I found Costa Rica very safe for female solo travelers. That being said, there’s no substitute for being smart. [link to article]. I did not stay in either San Jose or Liberia, both of which have reputations as less safe. Even safe cities have dangerous neighborhoods. I rode public buses to get from my hotels to a place nearby I wanted to see, and felt fine. People even helped me! However, I did not ride public buses with my luggage when changing cities. In Brasalito my hotel manager told me to be home by dark, and I listened. 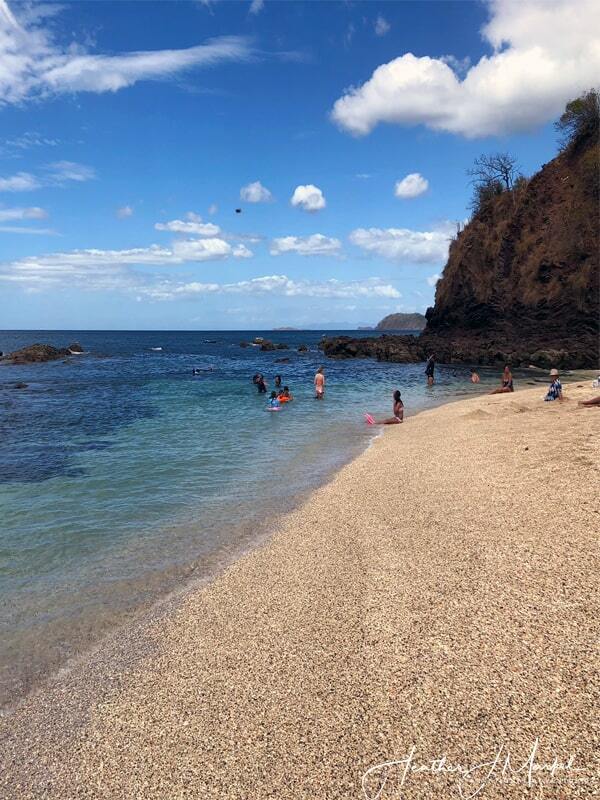 This was the only area of Costa Rica where, on beaches, I was approached several times by men wanting to know why I was alone and what hotel I was staying in. I told them I was meeting friends and left. On one occasion in Uvita I hiked up a long road to a waterfall. There were houses and some cars on the road, but not many lone walkers. A man walking down the hill at one point stopped me and asked if I wanted to follow him and see his “secret place” while staring at the bulge of my phone in my pocket. I said no and walked away. However, I was concerned about my safety so made friends at the waterfall who, luckily, had a car and got me to my hotel safely. The moral for me is, always trust your instincts and seek help when you need it. Authentic. Though many tourists are in Costa Rica, it still manages, somehow, to feel authentic. In fact, La Fortuna, which is one of the most touristy cities in Costa Rica still magages to maintain an authentic flavor to it. The only place I visited that felt truly built for tourists, not authentic, and that I disliked was Manuel Antonio. It feels like a city that was built around the zoo – all you can do is go to it (by the way, it is a neat zoo!) stay in an expensive hotel and lounge on the free beach along with everyone else. There is no real authentic flavor to it. 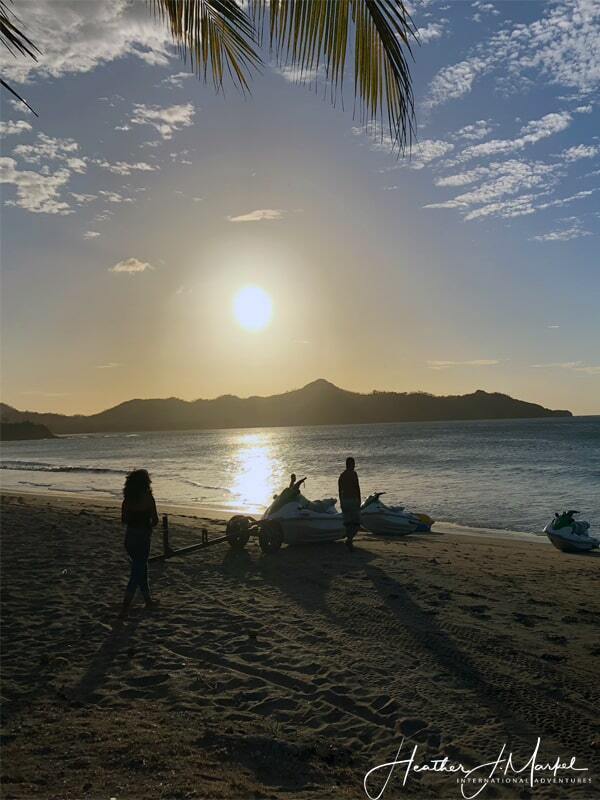 Its neighboring city, Quepos, is much more affordable and real feeling, however, it feels like a run-down beach town you don’t want to spend much time in. So, apart from these areas, I found that even though other tourists were there, I was still immersed in amazing surroundings and could be alone and discover things, or meet wonderful people. Recommended – paid private shuttles. As a female solo traveler, there’s no way I would have dared to rent a car in Costa Rica. Not only is it expensive, but the roads are in pretty bad shape in much of the country. If you’re caught out there somewhere in a bad rainstorm, I’m not sure what you do. I also heard stories about the public buses where drivers kind of make up their own stops for a long period of time, and often you’re in a bus with no open windows and no air conditioning, for hours, with no bathroom. I therefore did most of my traveling with Interbus and Caribe Shuttle. I say most of because even the largest shuttle companies do not cover all of Costa Rica. When I was in the far South (Uvita, Corcovado), the main shuttle company, Interbus, didn’t serve that area, so I got referred to another driver I ended up using. The downside of this is that if you are alone they have a minimum fare and you have to pay all of it. Happily, it’s under $50, but can rack up. When I was in Uvita and Cahuita I took advantage of the local buses to get to nearby towns like Dominical and Puerto Viejo. I only used them during the day or early evening and found them very safe. The only issue is that many of the bus stops are not clearly marked. If you live there, you know the patch of grass where the bus stop is. If you don’t, you’ll definitely be able to get OFF the bus somewhere close to where you want to be, but getting on the bus might be more challenging. Cheap eats and good negotiating. One easy way to save money is on food. As often as you can, eat in a SODA. These are local, family run, restaurants. It’s a lot of rice and beans, but for roughly $5 a meal, you will not go hungry! Try to find a travel friend when changing locations so that when you get a private shuttle, you can be sure to pay less than the full fare. Know that you can negotiate a lot of surprising things (see the negotiating tips below) which will also save you money. If you want to risk it, the public bus is definitely a lot cheaper than private shuttles. You just have to be really careful that your luggage is not stolen off the luggage rack and determine whether the potential of losing some luggage is more or less expensive than paying for a private shuttle. Stay in hostels or AirBnBs or no-name budget hotels. Price comparison and just asking. I learned, late in my trip, that you can, essentially, negotiate anything! In fact, day tours were the biggest surprise to me. I started looking at the day trips hostels offered and their prices, and then went to the local tour companies and bargained, saying that I saw another price had the same tour for a lot less money. I was told, in fact, to shop around with 3 – 4 tour companies before booking. In La Fortuna, I saved roughly $80 for two tours with this habit! I found that the way to negotiate was to be nice, simply say I noticed a less expensive price someplace else, and ask what they could do for me. Things worked out really well when I could say that a person referred me to the specific tour company, that I really wanted to use them, I was just concerned about the prices. Not required. Tipping is not expected, however you may find, depending where you eat, that a service fee is included in your bill. There are some scenarios where you may have receieved great service in a restaurant or from a tour guide where you may want to give them a tip. Some places also have a small jar for tips. When you order those great smoothies you can say an extra thank you, if you want! Sorry Charlie….I’ll just say OUCH! WiFi access was really difficult in Costa Rica. In smaller places like Uvita, I was told that the ENTIRE town/all the hotels shared 2 GIGs of bandwidth. So, even a hotel with multiple WiFi names and routers didn’t work well when all the guests were trying to be online at the same time. This is not a country where you can be on your laptop and phone all day. (And, when it comes to self discovery, that’s in your favor!) If you’re a blogger uploading images, invest in software that allows you to compress your files or you’ll never be able to upload them! Easy….Most convenience stores sell pre-loaded SIM cards, and allow you to add money to your phone right in the store. (Make sure you write down your phone number or you won’t be able to recharge it!) Kolbi is one of the main cell phone providers (I.C.E.) they also have Movistar and Claro. Mostly Good. On average, toilets are clean and all were Western style, even at bus rest stops. In some places, however, they do not want you to toss toilet paper in the toilet. One place I stayed in the Drake Bay/Corcovado area didn’t empty the wastebaskets regularly enough, and well, P-U! Lots. If insects and bugs creep you out, you may want to reconsider Costa Rica as your destination. Ciccadas fly around at night as if they’re drunk and may land on you. They’re huge. Roughly 6 inches long which is half a foot. Too huge. I woke up one morning to a Wolf Spider crawling on my floor (and wondered where it was all night) and another night slept with large roaches crawling around the floor. I frequently slept to the sound of geckos and howler monkeys. I learned to take it all in stride and still actually miss the morning howler monkey wake-up calls. One thing you can’t escape are the mosquitos. I actually didn’t have much trouble with them except when I was in Cahuita/Puerto Viejo where they just seemed to consider me a buffet. Happily I didn’t get sick. Complicated. It’s always a good idea to check the US government website (or your country’s local government if not the US) for in-depth information. In Costa Rica, you have to show proof of exit. So that means, if you’re planning to long-term travel for months around Central America, and don’t know when you’re leaving, where you’re going, but know it’s not a round trip back to the US, then you’ll at least need to buy a bus ticket or cheap flight that you can show a custom’s official so they can see you have an actual ticket to leave the country. Very Good. The tap water in much of Costa Rica was drinkable. Especially in La Fortuna I filled my water bottle straight from the tap every day and never had any stomach issues. Ice in drinks was also not a problem. I got a tick bite while in Uvita and a local pharmacist gave me some antibiotic ointment and anti-parasite pills. A couple of weeks later, the bite wasn’t much smaller so I consulted a doctor at a clinic in La Fortuna. I got a full consultation, the doctor was lovely and professional and spent a substantial amount of time with me. All for $50 plus the cost of medication. No proof of insurance card required. Also, consult the CDC website for recommended vaccinations and health concerns. I was vaccinated for Hep A and Typhoid and got a Booster shot update before going. Warm. Dry vs Rainy Seasons. Costa Rica is warm year round. In January, temperatures are in the 90s. Summer months tend to rain a lot and can lead to mudslides – definitely don’t take driving lightly if you’r renting a car. An insulated water bottle is your best friend. (Here’s another one I recently found that I’ll be trying out.) Costa Rica is hot, you’ll probably hike, and it’s easy to get dehydrated. In six weeks I did not see any insulated, high quality water bottles in Costa Rica. They were all single layer aluminum that would no doubt heat up as quickly as plastic. Since you can drink straight from the tap in many places, and you’ll certainly want cold water throughout the day, this is a great investment. If you plan on doing anything adventurous, you might want to invest in a trekking pole as some of the group hiking tours end up being steep! A rain jacket, especially if you’re there in the rainy season. Sunblock and mosquito repellant are absolute musts. A hat to block the sun and a beach towel are also helpful, of course you can buy both over there if you forget. I bought a sarong/wrap while there for about $8 that ended up doubling as something I could lie on the sand with that dried quickly. Everyone in Costa Rica is amazingly friendly, especially the locals. I miss them saying “pura vida” and “con mucho gusto” at every turn. When staying someplace for a while, I found the best ways to make friends was with locals by going to the same places to eat, have coffee, etc. One of the most wonderful friends I made there was at a coffee shop in La Fortuna. I made some other wonderful friends with fellow travelers while on my many bus rides. And when I ate in a Soda I frequently started talking to the people at the next table. For self discovery, nothing’s better than sitting on a beach (ideally in the shade!) or walking through nature. That’s top of the list! Other great things to do are braving the Zipline, if you never have – what a way to pop out of your comfort zone! Take a coffee tour someplace, they’re fascinating, as are the chocolate tours. In La Fortuna, don’t miss out on the thermal baths, but go to the ones the locals use – they are WAAAAY cheaper! Also do a night walk – you’ll see amazing wildlife that you don’t by day. The ones in La Fortuna appeared to be better than those in Monteverde. 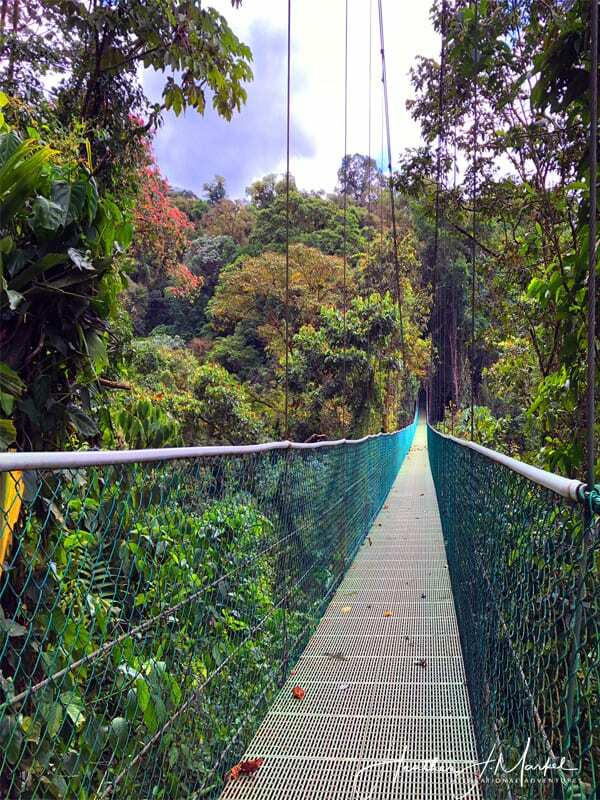 A hanging bridge walk is also a must do, as is a visit to a Sloth Sanctuary! Hotel Nany – the manager, Julio, made my stay. We spoke every day, he gave me great advice about Brasalito and where to go nearby, and even got me to taste Palm wine, a local delicacy! Hotel Regina – when I was in La Fortuna, this was a really great inexpensive hotel. It’s sort of just at the edge of La Fortuna, and it’s definitely a budget hotel. There is a guard outside at night. You are by the road so you should invest in ear plugs. But you can’t beat the price! Volcano View Apartment – my favorite place in La Fortuna was this AirBnB – it’s actually 3 apartments next to one another. I used the middle one. The location is, again, at a sort of edge of the city, so I will say that at night, though it was safe, I definitely noticed it was very quiet so didn’t stay out late. But the apartment was clean, lovely, clean sheets, hot shower. I did hear the neighbors through the walls, ear plugs to the rescue! Casa Jungle – loved this place in Monteverde! It was more of a bed and breakfast so I got to meet other people staying there. The owner runs the place with his mom and they are lovely and live on site. They make you a wonderful breakfast every morning! Hotel Samsara – this was the place I had a spiritual experience in Uvita. They are surrounded by nature, and there is a gorgeous hike through the woods that takes you to an almost deserted beach. They make great food, and a mean margarita! The staff is lovely, and the owners, from Cuba really made my stay. If you read bad reviews, note that they bought the hotel at the start of 2018, taking over from some owners that were apparently horrible and didn’t take care of the place. If you read more recent ones from 2018 they’ll give you an idea of how great these new owners are!